AltBerg Leder Gris, MOD Brown nourishes, protects & feeds Leather. 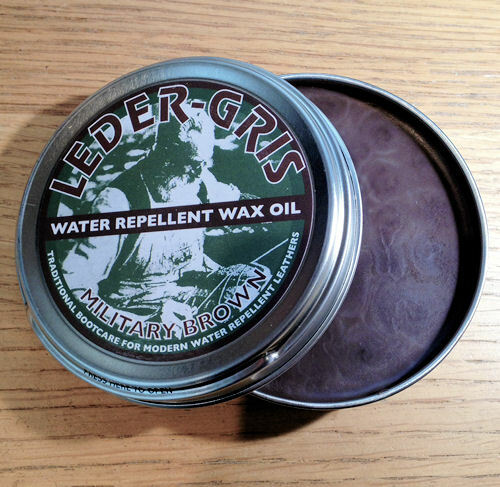 Leder-Gris® Original is a mixture of 70% wax and 30% oil. It has been developed for everyday use in average UK conditions. The wax provides waterproofing, as it dries it remains on or just below the surface. Regula use: Leder-Gris® Original can be used regularly, it will not over-soften, or damage leather if used excessively. If leather shows signs of hardening, or flex cracking, use a single treatment of Leder-Gris Xtreme, which is an occasional use restorative treatment. Not tested on animals. Flammable. Keep out of reach of children. If swallowed, seek medical advice Avoid contact with eyes and mouth. Alt-Berg only recommends Leder-Gris, we DO NOT recommend dubbins, saddle soap, or any kiwi type polishes All leather will eventually show signs of cracking where the boot flexes. Treatment with Leder-Gris® will slow down the rate at which this cracking will occur. Drying boots too quickly will harden the leather and accelerate flex cracking - rapid drying may also shrink the boot and alter the fitting. Always let boots dry naturally in a cool place. Use Leder-Gris® Xtreme (red label) occasionally.